About a decade of dimethylsulphide (DMS) measurements in the North East Pacific are summarized and compared to model simulations. Bottle samples at various depths have been taken three times per year along Line P from the British Columbia coast to Ocean Station Papa (145° W, 50° N). Despite the long timeseries, DMS measurements are still sparse and the data show large variabilities in concentrations both spatially and temporally. DMS concentrations in late summer have been consistently high, while spring measurements at the offshore stations suggest a downward trend over the past years. Low values in spring, however, have also been recorded in the late 1990s, which might hint to interannual variability in the onset of the spring bloom and/or plankton assemblage rather than to a response to recent climate change. Some of the variability, both short-term and interannual, can be caused by regional or local preconditioning of the physical environment. The model simulations provide examples where periods of low winds, shallow mixed layers and sometimes high irradiance follow a mixing event and cause DMS peaks on various time scales as well as consistently elevated DMS concentrations for longer timeperiods. The model in its current configuration, which has been calibrated with measurements in the late 1990s/early 2000s, is not able to capture the low values in winter and spring observed in recent years. 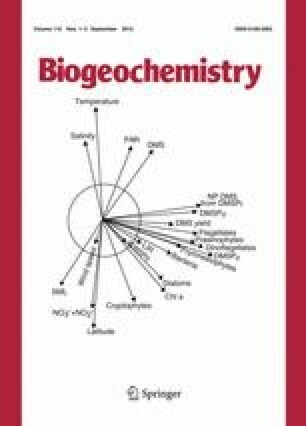 We suggest that this is due to missing or misrepresented links in the biogeochemical parameterizations of the model, e.g., an incomplete representation of variations in the phytoplankton assemblage. Including a seasonally varying S:N ratio to account for the absence of dinoflagellates in winter and spring significantly improves the simulation. Variability in DMS concentrations can also be induced by natural iron fertilization, which the model reproduces when timing is specified. For example, the model can reproduce the effects of natural volcanic Fe fertilization on surface water plankton dynamics and mixed layer DMS accumulation. The model also shows that the amplitude of the short term variability (days) increases when DMSP producing phytoplankton are less iron limited. We thank Martine Lizotte, C.S. Wong and Emmy Wong for their involvement in the DMS timeseries, Nina Nemcek for the analysis of HPLC samples, Lizzy Asher for sharing her insights into the MIMS data, and Ken Denman for his contributions to the development of the DMS model. We are grateful to the officers and crew of the CCGS John P. Tully for their assistance and cooperation. NCEP reanalysis data were kindly prepared by Steve Lambert. Argo data interpolated to OSP were kindly prepared by Howard Freeland. The latter were collected and made freely available by the International Argo project and the national programs that contribute to it (http://www.argo.ucsd.edu, http://argo.jcommops.org). The work was supported by grants from the Natural Sciences and Engineering Research Council (NSERC)(M. Levasseur, P. Tortell), as well as contributions from Environment Canada and from Fisheries and Oceans Canada.